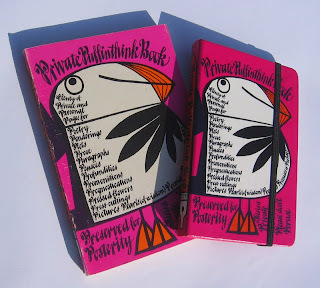 Puffin Thinkbook – The Return!! Well, I finally did it! I mentioned in my earlier blog entry that I would attempt to tun my Moleskine sketchbook into a Thinkbook – It worked! This is my old Thinkbook from 1979 with the new improved model of 2008. Now my kids are bugging me for one as well! Talk about making a rod for my own back! I think that's the most beautiful moleskine I've ever seen. How, how, how did you do it? I used a high impact product that Xerox developed and introduced a few years ago called Durapaper labels. I was their Military,Government and Health sector supplies account exec for nearly three years, and these were a real hit with the Military and Hospitals. I should add that I left Xerox several years ago. They are almost indestructible and can be run through a laser copier/printer. I created a template based on the measurements of the Moleskine and applied VERY carefully, cutting a series of notches at the corners and spine to fold over. The difficult bit is the elastic strap. If you want to try for yourself, they are available in A4, A3 and SRA3 sizes, with a pack of 50 A4 labels costing around £35.00. Start with a high resolution or vector image to get the best results.